Dorothy G. Schalk, 86, of Tiffin, joined her heavenly family Saturday afternoon, June 2, 2018, at Autumnwood Care Center, Tiffin. She was born April 2, 1932, at home near Fostoria, to Donald and Nellie (Feasel) Bishop. She married Donald Schalk April 18, 1951, her husband of 67 years. He survives in Tiffin. She also is survived by her three sons, Wayne (Vicki) Schalk of Uhrichsville, Patrick (Kathleen) Schalk of Pataskala and Stephen (Jane) Schalk of New Riegel; a daughter, Elaine Horvath of Tiffin; two brothers, Jacob (Sylvia) Bishop of New Riegel and James (Paula) Bishop of Fostoria; a sister, Thelma (Wayne) Gerschutz of Carey; 14 grandchildren; and 13 great-grandchildren. She was preceded in death by her parents and three sisters, Marie Geiger, Helen Schlacter and Edna Cook. She graduated from McCutchenville “Scutch” High School in 1950. She retired from Tiffin Mercy Hospital after 26 years of service. She enjoyed kntting, crocheting, cooking and baking, as well as her flower garden. She loved to spend time with her grandchildren and great-grandchildren. She also enjoyed attending their school/sporting events. Friends may visit with family 2-4 and 6-8 p.m. Wednesday, June 6, 2018, at Hoffmann-Gottfried-Mack Funeral Home & Crematory, 236 S. Washington St., Tiffin, OH 44883. Dorothy was a long-time member of St. Mary Catholic Church. 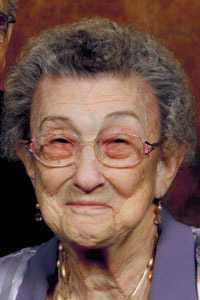 Her Mass of Christian burial will begin at 10 a.m. Thursday, June 7, at St. Mary Catholic Church, Tiffin, with the Rev. Gary Walters officiating. Burial will follow in St. Mary Catholic Cemetery, Tiffin. Memorial contributions may be made to Bridge Hospice and a charity of the donor’s choice.